Former Detroit Mayor Dennis Archer joined the Democratic National Committee’s Forward Together bus tour last week on its stops in Detroit, Dearborn and Pontiac to support Democratic Presidential nominee Hillary Clinton and to encourage people to vote on Election Day. 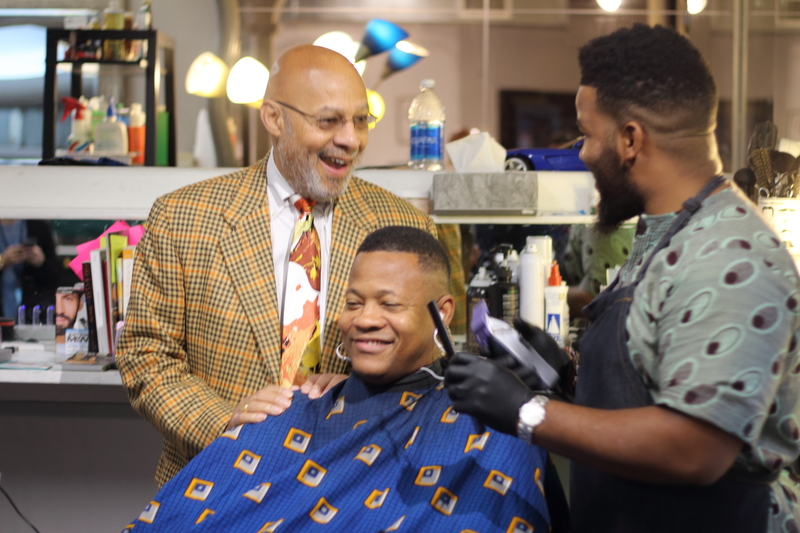 At one of the tours’ stops, Former Detroit Mayor Dennis Archer visited local barbershops to engage with the community about the upcoming election. Many people, including Mayor Archer, believe voter turn out in this election is especially crucial. “I think this election has been the most unusual in my lifetime. I’m 74 years old. I started voting the first time when I was age eligible. So, I haven’t missed a vote since. I’ve watched a number of presidential elections and I can’t think of any that are close to what we have seen,” the former mayor said. The city of Detroit continues to be an important city for the presidential race as Detroit has been first to feel the consequences of a declining economy. Archer believes the legacy set forth by President Bill Clinton will continue to be realized under the presidency of Hillary Clinton. With two very different candidates, it is experience, Archer said, that sets Clinton apart. It is this divisiveness that has contributed greatly to the already volatile racial climate in the country today. Under policies proposed by Donald Trump, communities with populations of people of color like Detroit and Dearborn will be adversely affected. The risk of a President Trump, Archer believes, is too great. The second stop along the bus tour was the Arab American National Museum in Dearborn for a roundtable discussion with community leaders from the Arab American community. Panelists included Ishmael Ahmed, Michigan State Board of Education nominee, Abdullah Hammoud, Michigan State Representative candidate for the 15th district and Dr. James Zogby, founder and president of the Arab American Institute. The issue of racism and discrimination was the main topic discussed. The divisiveness created by the numerous controversial comments made by Trump and his campaign has given rise to a new breed of bigotry that has led to increased discrimination of people of color, women, immigrants and Muslims. Michigan State Board of Education nominee Ishmael Ahmed said he believes the increase in bigotry and proposed policies that will legalize discrimination that make this election one of the most dangerous yet important elections of our time. “I fear for my children and grandchildren,” Ahmed said. Tags: Campaign 2016, Dennis Archer Sr.